Our New England Driving Tour is rich in history and culturally diverse featuring beautiful scenery and easy driving distances. A tour of New England by car is the perfect holiday in the USA whatever the season. Drive only 2 1/2 hours from New York’s airports to central Connecticut. Or drive only 2 1/2 hours from Montreal’s airports to central Vermont. New York to Boston is 4 hours. Boston to Central Vermont is 3 1/2 hours. And all the while you will be enjoying scenic countryside, charming small towns, and interesting places to stop and visit. Note: I am the innkeeper at the Governor’s House in Hyde Park and I created this page to help travelers find the best of what interests them and create their own driving tours of New England. I am a native of New England, ex-school teacher, and inveterate traveler who knows New England well. Each list has been prioritized by my personal preferences. I am happy to use my experience to help you plan a route that includes what you’ll enjoy most and, of course, a stay here at the Governor’s House. A few sections are still under construction. Click here for a map of Connecticut. 4000 years of Native American history. Charming, classic small town beside the Connecticut River, it was once prominent for shipbuilding, burned by the British during the War of 1812, and has been recognized as the “best small town in America”. The Connecticut River Museum on the water at the end of Main Street houses the Revolutionary War submarine, the Turtle, and offers afternoon and evening sailing cruises aboard a schooner. Dine at the Griswold Inn on Main Street which opened in 1776. Vintage steam engines and passenger cars chug along through scenic countryside along the Connecticut River. Since 1953, but reenacting an 1879 event, the annual parade and muster of up to 70 fife and drum corps from all over the country is held on the third Saturday of July. Reenacters, refreshments. Among the impressive collection, you’ll recognize some things from your American history book. Painting, sculpture, and American decorative arts. An impressive collection of Hudson River School paintings and the large canvases produced by Jonathan Trumbull for the US capital. The studies for these are on display at the Yale Art Gallery and make an interesting comparison. Mon. – Fri. 11:00 – 5:00, Sat. & Sun. 10:00 – 5:00, 1st Thurs. of the month until 8:00 p.m. Guided tours of the author’s Victorian mansion. Visit Harriet Beecher Stowe’s house next door. Shopping, display gardens, gardening events. Independent bookseller with many store events in the charming shoreline town of Madison. This Victorian cottage was the home of America’s only Nobel Prize-winning playwright, Eugene O’Neill. Check the website for the Eugene O’Neill Theater Center in Waterford for production schedule. local produce in a gracious country setting. Click here for a map of Rhode Island. Charming cobble-stoned down and wharf area with charming shops and wonderful architecture, the International Tennis Hall of Fame, and the famous Cliff Walk. For sailing try www.sailnewport.org or www.sail-newport.com. Marble House, The Breakers, and Rosecliff are just three of the great houses of the Colonial and Victorian periods and “summer cottages” for the very wealthy from the opulent Gilded Age which are maintained by the Preservation Society of Newport County. They are open for public viewing and also used as venues for musical events. Some are decked out in period holiday decorations and there are evening holiday tours which include music and refreshments. www.newportmansions.org. This national recreational trail within a national historic district is a unique combination of ocean-side nature trail and spectacular architecture. Begin at Easton’s Beach and watch for uneven places and poison ivy. This small island with lots of beach and clean, clear water might be the best place to sample New England’s fresh seafood. It was originally inhabited by Naragansett Indians, discovered in 1614 by a Dutch explorer named Adrian Block, settled in 1661, and used for keeping a lookout for British ships during the Revolution. Rumor has it that Captain Kidd buried some of his treasure there. There are regular ferries form several places and a daily twelve-minute flight from Westerly, Rhode Island. Leave your car on the mainland and rent a bike. There are several places for overnight accommodation including the 1854 Spring House. The Boston Freedom Trail was created over 50 years ago and has grown to 2.5 miles of red-brick path which leads through the city connecting 16 nationally significant historic sites including museums, churches, meeting houses, parks, a ship, Paul Revere’s house and others, and Faneuil Hall with its bustling market and waterfront. The John Hancock Tower of 62 stories has an observatory which gives a good panorama of the city and a display which shows how Boston grew and changed shape as the hills were used to fill in the back bay which explains the need for Paul Revere’s Ride at the opening battles of the Revolutionary War. The Boston Pops Orchestra has its summer home at Tanglewood in the Berkshires, but does a series of free concerts in the Hatch Memorial Shell along the Charles River early in the season, including the famous Fourth of July Concert featuring Tchaicovsky’s 1812 Overture with church bells and cannon. Perfect for picnic suppers, but get there early. See Lenox information below. Some of the most rare and important artistic treasures in the world are in the collection of more than 450,000 objects and many paintings will be recognizable from American history textbooks. The Gardner Museum is three floors around a courtyard and houses her impressive personal collection of art. Scene of the “Shot Heard Round the World” that sparked the American Revolution, center of the nineteenth century transcendentalist movement, home of Emerson, Hawthorn, the Alcotts, and others, and the place where Thoreau built his cabin at Walden Pond, Concord is a charming New England town very rich in history. The Concord Museum has a good collection of author-related items and the Ralph Waldo Emerson Memorial House right across the street gives tours. Visiting Orchard House where Louisa May Alcott grew up and dramatized with her family is a little like stepping into Little Women. Walden Pond is no longer the peaceful retreat it was when Henry David Thoreau built his cabin there in 1845, but you can swim, fish, kayak or canoe, and hike in summer or cross-country ski and snowshoe in winter, including a hike (or ski) to a recreation of the cabin. Thoreau’s Path on Brister’s Hill is a one-mile, self-guided, interpretive trail through Walden Woods. It is possible to rent a canoe or kayak and paddle to the North Bridge, scene of the first battle of the American Revolution and made famous by Longfellow’s poem “The Midnight Ride of Paul Revere “. Then walk to the visitors’ center or to Nathaniel Hawthorne’s home, The Old Manse. The Concord Bookshop is worth a visit. Concord Bike Tours will provides a unique way to see the sites. The Minute Man Visitor Center in Lexington is a good place to begin your visit of the historic sites in 1775. Massachusetts celebrates Patriots’ Day each April 19th with reenacted battles. A recreated 1627 village staffed with knowledgeable costumed roll-players who tell the story of the earliest English settlement in New England and the birthplace of our Thanksgiving holiday. The Wompanoag Homesite is a recreated Native American settlement. The Mayflower II is a reproduction of the ship which carried the Pilgrims from Plymouth, England in 1620. A great place to celebrate Thanksgiving (3rd Thursday in November) with either their traditional Victorian turkey dinner or the typical meal of 1650 which comes with entertainment, but no forks. Note: The spelling of the modern town is Plymouth. Experience life in the New England of 1830 in this village created with authentic period buildings. Costumed historians portray farmers, housewives, blacksmiths, millers, soldiers and others. Special activities and events showcase the extensive collection. Wagon and stagecoach rides. Farm animals. Food is available in the tavern or the bake shop. Nice book and gift shop. Open year round except winter Mondays. Close by is the Publick House, an inn built in 1771 with traditional dining and guest rooms. Nestled in the gently rolling Berkshire Hills of Western Massachusetts, Lenox was the summer home of many wealthy turn-of-the-last-century families. The beautiful quiet countryside still exists, but now also offers a home to many visual and performing artists. Tanglewood is the summer home of the Boston Symphony Orchestra and is the beautiful setting for symphonic, chamber, popular artist and jazz performances weekdays and weekends throughout the summer. Several venues have indoor seating, but the grounds are perfect for picnicking. 30 years of Shakespeare productions. A schedule which includes many plays on several indoor and outdoor stages: morning, noon and night. There are free family performances, forest trails to stroll, and grounds for picnicking. June through October. The American Scene in one of its guestrooms. A large collection of Norman Rockwell’s art and his studio. The home, studio and garden of Daniel Chester French, sculptor best known for the statue of Abraham Lincoln in Washington DC’s Lincoln Memorial and depicted on the US penny. 200-year-old Shaker site with 20 historic buildings, working farm, herb gardens, and craft demonstrations. Talks on Shaker life, worship, agriculture and technology, and Shaker suppers. Hiking and cross-country ski trails and guided walks. Buildings open April – Oct. The largest collection of contemporary art in the country is housed in a Nineteenth Century factory building. In the 1700’s, Deerfield was the frontier and the region is still called the Pioneer Valley. The small village of Deerfield is a brilliant example of 18th Century architecture and it is possible to visit eleven of the beautiful houses as well as a museum store and the Hall Tavern Visitor Center. There are demonstrations of 18th Century open-hearth cooking and shoe making. A one-third-mile footpath to the Deerfield River is fully accessible, May – December. Built in 1884, the Deerfield Inn lies in the center of this National Historic Landmark village offering Champney’s Restaurant and Tavern and 24 guest rooms in the center of Deerfield’s historic district. With cozy nooks for relaxing, a porch for dining, and horse and carriage rides in summer, it’s a truly unspoiled New England experience. This family-run business is home to delicious specialty candies, hand-dipped chocolates, original recipe fudge and seasonal specialties like chocolate-covered strawberries and chocolate caramel apples. Salem was a thriving commercial port during the age when clipper ships plied the oceans of the world and there are many stunning examples of Federal-style architecture that survived from that time. With treasures from far-off places, prosperous sea captains in 1799 founded the Peabody Essex Museum. Several buildings also survive from the 1600’s when Salem was notorious for its Witch Trials and tours recreate some of the events from that time. Open daily 9:00 – 5:00 except some holidays, this is a good place to start. They offer a free 27-minute movie, Where Past is Present which is close-captioned and translations are available in several languages. To download a walking tour of Hawthorne’s Salem, go to the website. It is not surprising to find a huge collection of art and artifacts in this, the oldest continuously-operated museum in the country. The novelist Nathaniel Hawthorne was born in Salem and made famous the House of the Seven Gables in a book of that name. The house is the oldest surviving 17th-century wooden mansion in New England. Open daily June 30 – October 31, 10:00 a.m. – 7:00 p.m.
Two islands off the Massachusetts coast with a lot of charm, great beaches and often a lot of summer visitors. Both are delightful in the fall. There are ferries and commercial flights. Martha’s Vineyard is the closer. Buses connect the six towns so leave your car on the mainland and rent a bike on the island. Edgartown is an old port known for sailing. Oak Bluffs has many prettily-painted Victorian houses and the nation’s oldest carousel. Fresh seafood abounds. Nantucket is the name of the island and also the town which was an early whaling port and still retains much of the character of the time with beautiful old houses and cobbled streets leading away from the wharf. Open to the public are four buildings maintained by the Nantucket Historical Association: the Whaling Museum, Quaker Meeting House, a Greek Revival residence called the Halvern House, and the Old Mill which is the oldest functioning mill in the country. The island has beautiful beaches and is great for biking, swimming, sailing and sea food. Endeavor Sailing offers day sails and charters May to October. A wonderful museum in an old candle factory where you’ll learn about the exciting and dangerous life of the whalers and see first hand how really big a sperm whale is! $15, seniors(65+) $12, 6-17 $8, also a combination ticket for the Whaling Museum and 4 other sites maintained by the Nantucket Historical Association. Built in 1759, the classic Georgian mansion was General Washington’s headquarters during the American Revolution. Almost a century later, it was home to Henry Wadsworth Longfellow and a gathering place for friends including Thoreau, Emerson, Hawthorn, and Dickens. A classic, lively college town with lots of good places to eat. The Norwottuck Rail-Trail is a ten-mile, wheel-chair accessible bike trail which follows the old railroad bed across the Connecticut River and on to the town of Amherst. A 90-minute guided tour of the Homestead and The Evergreens starts at the Visitor Center. “This was a Poet” is a 40-minute introduction to the poetry of Emily Dickinson. The grounds are open free of charge during museum hours and there is a self-guided audio tour to accompany your walk. March through December, 11:00 a.m. – 4:00 p.m.; closed some holidays. Changing exhibits showcase the illustrations of Eric Carle and other artists. There is a reading library, a hands-on art studio, and an auditorium for theater and film. Museum shop. In 1862 Henry Wadsworth Longfellow visited this inn that started as a stagecoach stop in 1716 and used it for his book of poems, Tales of a Wayside Inn which includes his famous “Paul Revere’s Ride”. Today there is a restaurant, tap room, bake shop, and ten guest rooms as well as lovely grounds and a grist mill to explore. This is probably the best antiques event in the country with 5,000 dealers buying and selling fine Early American antiques, Victorian pieces and absolutely everything else. It happens three times each year and lasts several days. The 2010 dates are May 11 – 16, July 13 – 18 and September 7 – 12. There is a stretch of Route 7 in western Massachusetts in and near the town of Sheffield which is lined with antique shops. There are dozens of shops of every description and a wide variety of quality. Some specialize in a certain period, others concentrate of specific items like table settings or books. Click here for a map of Vermont. Superb collection of American design on 45 acres: fine art and folk art. Something for everyone from samplers, toys and teacupsto covered bridges, locomotives and lighthouses, a Rembrandt, and a working carousel. Recent special exhibits have included Mary Cassatt paintings and the glass of Louis Comfort Tiffany. May 15 – October 31 & Thursday evenings until 7:00 June 23 – August 11. Adults $20, children $10, special rate for students &teachers. Ticket is good a second day. Near-by Shelburne Farms on the shores of Lake Champlain is a working 1400-acre farm and National Historical Landmark originally laid out in 1886 on 3800 acres by Frederick Law Olmstead as a model agricultural estate. It is now an environmental education center with guided tours, children’s farmyard, an inn, and dining mid-May to mid-October as well as special events and eight miles of walking trails that are open all year. On the shore of Lake Champlain with the Adirondack Mountains in the distance and home of Ben & Jerry’s, this small city with a “college town” atmosphereand unique, lively down-town mall also has a variety of museums and lots of interestingthings to do along the shores of Lake Champlain plus ferries and tour or dinner boats on the lake. A bike path causeway reaching far into Lake Champlain and seasonally connects to the islands by ferry. Rent sail boats by the hour at Community Sailing. Leunig’s Bistro on the mall doesn’t exaggerate when it boasts the “panache of Paris”. Frog Hollow Gallery is a contemporary gallery on the mall dedicated to the exposure and appreciation of Vermont fine art and craft. The farm and forestry operation that Frederick Billings started in 1871 continues today as a first-class working farm and museum to tell the story of Vermont’s rural past. Open daily May 1 – October 31, 10:00 – 5:00, weekends November – February & Christmas week. It is possible to tour the mansion and grounds of the adjacent Marsh-Billings-Rockefeller National Historic Site which display a good collection of American art and artifacts. The trails and carriage roads are groomed in winter for cross-country skiing. A charming New England town in the Vermont hills with beautiful Colonial architecture, a down-town shopping area with many unique shops, and a seasonal farmers’ market on the town green. Close by is the President Calvin Coolidge State Historic Site and the National Historic Landmark Cheese Factory with on-going cheese-making open to the public. 10:00 – 4:00 Sundays, longer summer & holidays. The 270-mile footpath follows the main ridge of the Green Mountains from Massachusetts to Canada. Built between 1910 & 1930, it’s the oldest long-distance hiking trail in the country and the beginning of the Appalachian Trail. There are 175 miles on its 82 side trails. Guides and maps available. This 300-mile cross-country ski trail with a variety of terrains and difficulty goes from Massachusetts to Canada and connects with the VAST trails. Five acres and fourteen buildings display small watercraft, steamboats, lighthouses, and nautical history and archaeology in addition to special exhibits and events. open daily mid-May – Mid-October, 10:00 a.m. – 5:00 p.m.
Quintessential small town New England and world class resort nestled into the Green Mountains with a wealth of great restaurants and dozens of art galleries and charming shops. In winter ski, snowshoe or try dog-sledding; there’s great hiking, canoeing and biking in summer as well as theater and music. And fall is still the best season of all with a panorama of color painting the mountains and hills. The 4.5 mile Toll Road, an intermediate ski trail in winter, winds nearly to the top of Vermont’s highest peak, Mount Mansfield at 3850 feet. A paved recreation trail weaves its way rising gently for five miles along a bubbling river from the charming town center into the foothills. There are several well-marked access points with parking. In winter it is snow-covered and used by cross-country skiers, but is wheelchair accessible the other three seasons. The country’s smallest state capital may just be the most charming. The historic capital building is open to the public and free. You’ll find several nice independent bookshops and many restaurants including three associated with the New England Culinary Institute, but you won’t find McDonalds since Montpelier is the only state capital without one. Visit the State of Vermont Welcome Center in Montpelier. Driving in most of Vermont is spectacular in winter and summer, but even better in the fall. Many country roads follow streams which bubble down from the mountains along rocky beds and you’re never far from mountains. Downloadable driving directions for several tours will be added soon including Smugglers’ Notch State Park, named for the bootleggers who brought whiskey from Canada during Prohibition, and a loop through the hills to the north with a dozen covered bridges. Thirty showrooms and up to 165 dealers of the best fine art and antiques Vermont has to offer, including fine period furniture, silver, vintage quilts, rare books, toys, fine porcelain and glassware, oriental carpets and hundreds of original paintings and prints. Open every day except Christmas, Thanksgiving and Easter, 10:00 a.m. – 5:00 p.m.
Named for “Snowflake” Bentley, a local scientist who pioneered the study of snow crystals and gained fame with his photographs of snowflakes, this little family-run chocolate shop hand-dips chocolates the way they should be done. They also have a shop at the Blue Mall in Burlington. Try the dark-coated maple creams. Rustic life in the Vermont woods must have suited Rudyard Kipling as wrote that he was never happier than when he moved to Vermont in 1893 and built his house at Naulakka. It was there that he wrote and published The Jungle Books. The four-bedroom house in Dummerston is maintained by the Landmark Trust. It is not open to visitors, but may be rented by the week. Contact the Landmark Trust in England for details 01628-825925. Stop by the house where Robert Frost planted his beloved orchard and where on a summer morning he wrote “Stopping by Woods on a Snowy Evening ” . A wonderful rambling book shop where you can spend hours shopping for for books, music, children’s books, and great gifts. Events for adults and children. 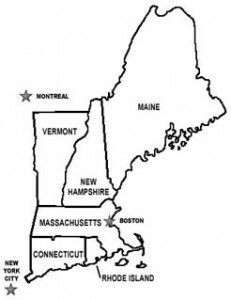 Click here for a map of New Hampshire. Part of the Presidential Range of the White Mountains, Mt. Washington was named for General George Washington in 1784. At 6,288 feet, it is the highest peak in the Northeast. Agiocochook, it’s native American name, means “home of the Great Spirit”. Legendary for severe weather, it holds the record for the highest wind speed on earth. The Appalachian Trail passes across its summit. The Tuckerman Revine Trail attracts hikers in summer and fall and serious skiers in early spring. Views from the mountain and of the mountain have been popular with artists since the mid-1800’s. Taking advantage of the wind, soaring has become popular. The toll road and cog railway give access to the summit. The weather can be erratic and severe in all seasons. Please take precautions before enjoying this natural treasure. Built in 1869, the cog railway was the first mountain climbing cog railway in the world and continues to lead the way with its news biodiesel engine. An old-fashioned steam engine still makes one run each morning. Open May through November for the three-hour trip. The Auto Toll Road provides access to the summit for cars, with some restrictions. This is New Hampshire Route 112 between I-93 and North Conway and named for a great chief of the Pennacooks. There are no services, just 35 rustic miles of spectacular scenery through the White Mountain National Forest with pristine spots for picnics and hiking. In winter the road may be closed due to snow. The section of route I-93 north of Concord, New Hampshire that passes through Franconia Notch State Park is very beautiful even without the Old Man of the Mountains, a natural stone contour on the mountain face and long New Hampshire’s symbolic logo which fell a few years ago. It is a great spot for hiking and picnics. The original Ariel tram at Cannon Mountain, the first of its kind on the continent, has been replaced, but still makes a nice ride to the top for summer viewing as well as winter skiing. It is possible to visit this peaceful farm and stop along the stone walls that border the property to read one of his well-loved poems, “Mending Wall” or download an interpretive brochure from the website. See website for barn opening times. A poet-in-residence program, but also a museum open in summer with Frost memorabilia and signed first editions as well as a half-mile nature trail which displays some of the poems he wrote here. This juried craft fair featuring many hand-made regional items started in 1933 which makes it the country’s oldest. It opens on the first Saturday each August and runs for nine days. Located on a cluster of islands on the Maine coast, Acadia National Park is known for its natural beauty. It has spectacular ocean-side campsites and a series of carriage roads with beautiful views. Mt. Cadillac at 1,530 feet is the highest point on the Atlantic coast. Park rangers offer a series of walks, talks, hikes, boat cruises, and bike rides. The June to October schedule can be found in the park newspaper, The Beaver Log. Sailing and sea kayaking nearby take advantage of the spectacular scenery. The park is open year round, but much of the Park Loop and the visitors’ center are closed for the winter. Acadia Park Kayak offers day, sunset and night guided tours. Bar Harbor is located on the rocky coast of Mount Desert Island and surrounded by Acadia National Park. Tourists have flocked there for more than 150 years, starting with the Hudson River artists and writers. Where, in the mid-1800’s there were classic huge wooden hotels where families would spend whole summers, now there are lots of cozy B&B’s. It’s the right place to look for day cruises and whale-watching trips. There are also ferries from Bar Harbor to Yarmouth, Nova Scotia. Portland is Maine’s largest city, an important port since colonial times. While it still has a vibrant working waterfront which ranks among the most important commercial ports in the US as well New England’s second largest fishing port, it also has a safe and charming waterfront with many shops, restaurants, and architecturally interesting buildings. The Maine Historical Museum has rotating exhibits and the Longfellow House next door which was the poet’s boyhood home is a good example of Colonial American architecture. The Portland Museum of Art and the city’s surprising number of art galleries are active with frequent gallery walk evenings which are very popular and draw a good cross section of the population. It is possible to take the over-night ferry from Portland to Yarmouth, Nova Scotia. Camden and near-by Rockport are those quintessential New England towns with old-fashioned charm and lots of antique shops. Both are located on the shores of Penobscot Bay and so offer fishing and boating opporturnites aa well as multi-day windjammer cruises where you’ll actaully help sail. Expect the beaches to be beautiful, but also as rocky as the rest of the coast. President Franklin Roosevelt’s summer home is found on a remote island that is actually on the very southeastern corner of New Brunswick, Canada. The island which is now reached via the Roosevent Internationl Bridge from Lubec, Maine, has been a summer destination since the mid-1800’s and Roosevelt first visited as a boy when his family had a house built there. He left the property jointly to the US and Canandian governments as a tribute to the good relationship between the two. It is the only national park that is shared by two countries. The island is located at the mouth of the Bay of Funday and the challenging walk to the East Quoddy Lighthouse must be timed to accommodate the tides which are the greatest in the world. Visit in summer to see soaring eagles and fields of lupine. The original L L Bean store in Freepart has become an institution. It’s always open, yes 24-hours a day and 365 days a year, which makes it easy to stop in on your travels. It is a great source of outdoor clothing and camping gear. From Vermont and New Hampshire, it is an easy drive to Montreal and Quebec City across the border in Canada. Quebec City is a charming French-speaking Old World city on the St. Lawrence River. Montreal is sophisticated and culturally rich with friendly people, wonderful food, and an underground shopping plaza which connects many central-city streets. A valid passport is required for border crossing. we advise checking the websites for things like opening times and prices.